Don't expect to call on Friday morning and get an evening reservation. Prime time seating on the weekend requires at least four weeks' notice. 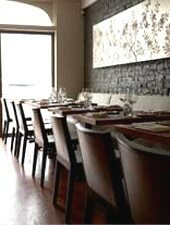 The intimate upstairs dining room seats 25-30 guests and is available for private soirees.